Hellgate sure knows how to tell everyone who's boss in the home borough! Our own Phenomenal Phil coasted in at College Point this weekend to become the 30th Annual Queens Half Marathon Overall Winner! His amazing 1:13:26 was over 2 minutes ahead of the 2nd place runner! Congratulations, Phil! Well done! We also have some other winners on the team! Ben posted a solid 2nd place age group award with an incredible time of 1:19:34 followed by Andrei who steamrolled into a 6th place age group award at 1:22:13! Then with the help of Diego and Fernando the men's team placed 3rd overall! In total 12 men participated Sunday and ran strong! On the ladies' side, Yvonne ran/swam through the 87% humidity to cross as the first female Hellgater in her comeback half marathon race! This new mama is gunning for the Philadelphia marathon, and it appears her training is on target! Following Yvonne was Diana, Chiemi, LuAnn, Rafaella, and Jaime who all overcame the miserable weather for the Ladies' team! Well run gals! 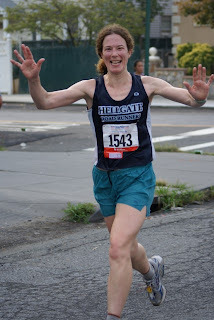 And on a bittersweet note, Diana ran her until-she-returns-race with Hellgate, and despite fighting an illness, she ran in a commendable and memorable race. Good luck with your travels, Diana! Hellgate can't wait to have you back in another year or 2!! We'll miss you! 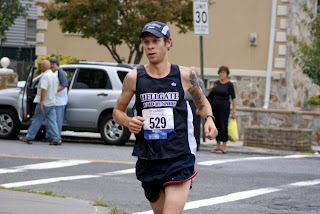 For all results please see the NYRR website and check out the cool video which follows the winner in his Hellgate singlet, Phil, throughout the race (in addition to a few quick peaks of other Hellgaters). 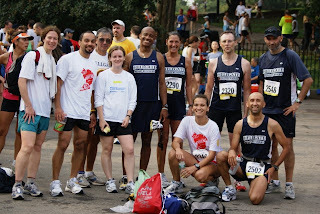 See if you can find all the Hellgaters in the NYRR photos too! Nice job Jessica - and so quick after race day too! Great work Hellgate! I know I'm not usually so quick with the writeups... I was just so inspired by my teammates' races, and I had some time at lunch,so I took advantage of it. Yes, great write-up, Jessica, and I truly appreciate your kind words about my departure. Thanks, too, for coming to the beer garden!